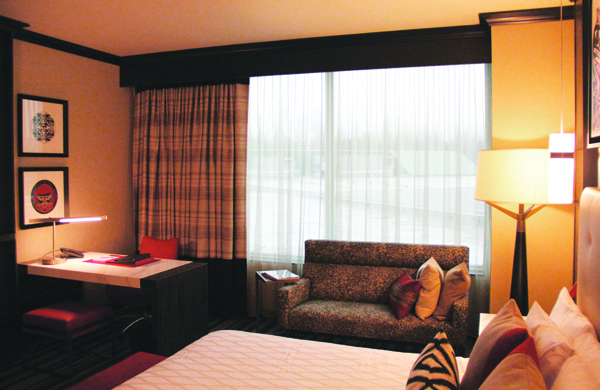 A glimpse at one of the renovated rooms at Tulalip Resort Casino hotel. A new year brings hope. A new year triggers a desire to change an aspect of your life. An optimistic spirit of “new year, new me” motivates many to make a New Year’s resolution. Even the casual social media user had their timeline plastered with New Year’s resolution aims, goals, lyrics, or memes. Most people declared to do more or less of something in their day-to-day lives, such as eating healthier, exercising on a regular basis, losing weight, quitting a bad habit, or learning how to better manage money. Well, as a brand and as a resort destination, the Tulalip Resort Casino has made a New Year’s resolution of its own: to return as the standard bearer for luxury accommodations that balance artistry, stylish elegance, and an abundance of comfort. 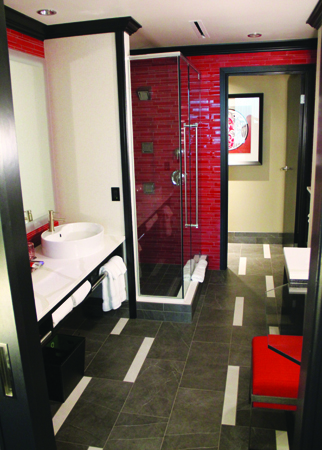 When the Tulalip Resort Casino (TRC) opened in May 2008 there was no question who had the most luxurious accommodations in the area, it was Tulalip. Fast-forward nearly eight years to the present and the TRC no longer stands head and shoulders above the rest. 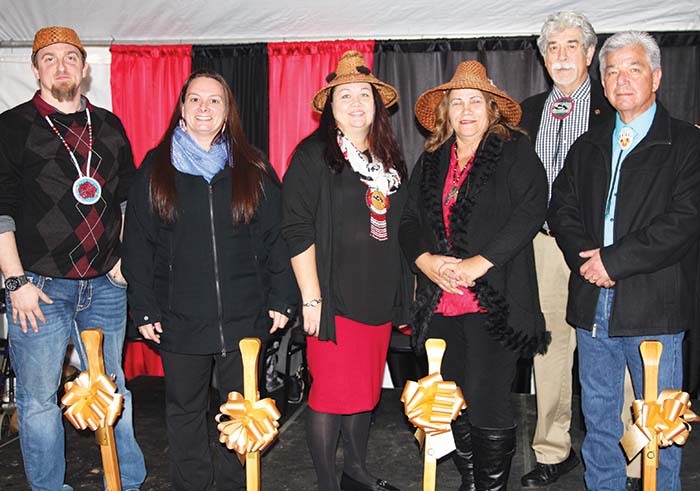 Over the past eight years, many tribes in the state have followed Tulalip’s lead and built their own resort casinos. Those with standalone casinos have added a hotel, those with a subpar hotel have upped their game by remodeling, and then there are the tribes who decided to enter the gaming world and invest in newly constructed resort casinos. All this is to say Tulalip now has competition where once there wasn’t any. Over the past eight years, the accommodations industry has seen trends change and upgrades in technology, furnishings, and in-room amenities that are now in demand by today’s guests. Frequent guests of resort casinos can notice the difference in room quality from an out of date accommodation, as do tribal members who have stayed at other newly minted hotels in the region. 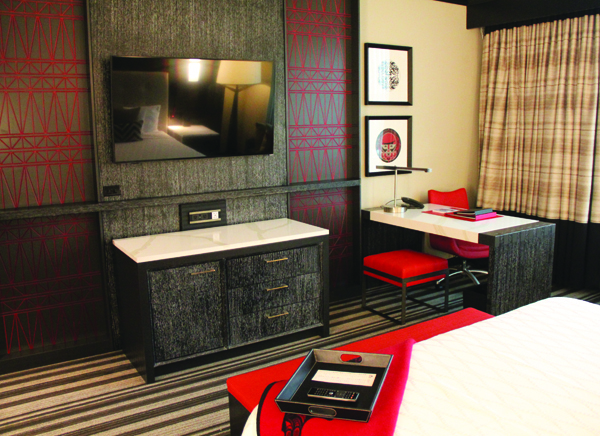 Because of this, the Tulalip Board of Directors and TRC executive staff deemed it time to renovate the hotel guest rooms and bring back the WOW-factor that Tulalip is known for. 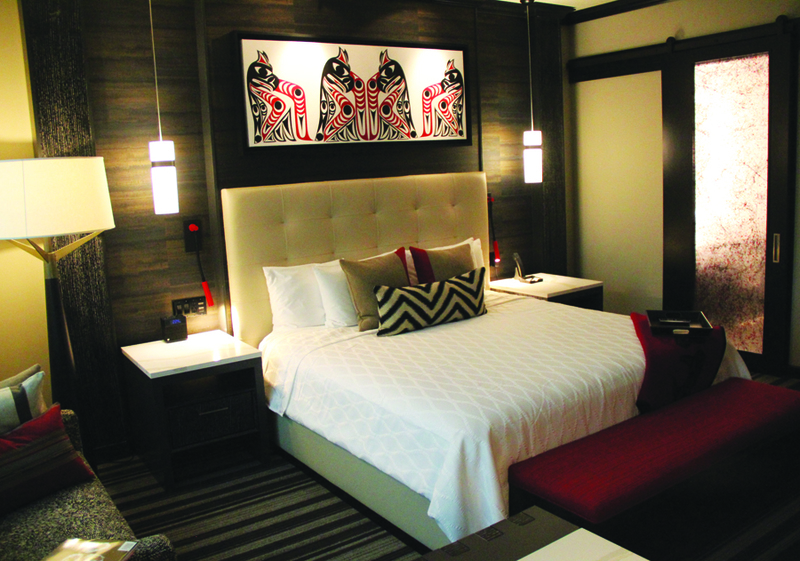 Of the two new room designs to be implemented in the renovation, it’s the Tulalip design that will be most prevalent. The Tulalip room design is self-evident; everything from the predominantly red and black color scheme, styling, design elements, artwork and even the carpet graphics have you feel like you are at Tulalip. Everything in this room is designed and geared for Tulalip culture and history, whether it’s a weaving token, fishing reference, or a stunning piece of artwork created by Tulalip artists James Madison and Joe Gobin. Bringing back the WOW-factor to the guest rooms will include introducing many new enhancements to each room. So from a whole new design with new and upgraded technology, furnishings, and amenities that will make guests have no doubt they are staying in Tulalip, to a whole list of guest enhancements that will continue to grow as renovation is underway and new ideas are introduced, Tulalip will be getting its WOW back. TRC guest room renovation is currently underway and estimated completion is March 31, 2017. Be sure to follow Tulalip News on Facebook for updates as the renovation is ongoing. “This will be our first hotel,” Mike Finley, chairman of the Colville Business Council, said. The Confederated Colville Tribes own three small casinos but no hotels. Surface preparation and some excavation for the site of the new Omak Casino Resort will begin about April 15, so cars can reach the location and people can attend the ground breaking projected for early May. The anticipated opening is about 12 months later. Omak Casino Resort will also be the first destination resort in Okanogan County and is expected to be an economic boon to the region as it will attract conferences. The casino portion will be twice the size of the tribes’ Mill Bay Casino located on a trust parcel near Lake Chelan. It will also replace the tribes’ Okanogan Bingo Casino. The new casino is expected to largely employ tribal members, Finley commented. Taylor-Woodstone Construction will oversee development; the Bloomington, Minnesota-based company has worked with a number of tribes on other casino projects, plus the huge Palazzo Casino Resort in Las Vegas, among others. This area is rich in cultural history. Five years ago, ground was being broken for a $24 million casino also near Omak, but when artifacts and human remains were discovered, the project was immediately shut down. “We ordered a full archeological excavation be done in that area,” Finley said. “It turned out to be the oldest recorded archeological site on the reservation.” That location will remain undeveloped; this new hotel/casino complex is a larger version of the previous, derailed plan. An artist’s rendering of what the new hotel at the Angel of the Winds Casino will look like, once it’s complete in 2015. — image credit: Courtesy image. ARLINGTON — Friday, Oct. 25, saw the Angel of the Winds Casino officially break ground on construction of a new $20-million, 125-room, five-story hotel. According to Travis O’Neil, general manager of the Angel of the Winds Casino, planning for the new hotel expansion began roughly 18 months ago, but the possibility of such an expansion was factored into the casino’s plans shortly before its previous expansion six years ago. Beyond the jobs that will be created once the new hotel opens, O’Neil also touted the local construction jobs that will be created in the meantime, since he expects that the Bellingham-based Excel Pacific will retain a number of subcontractors, whose employees he believes will likely include more than a few folks from Marysville and Arlington. The Angel of the Winds Casino is located three minutes east of I-5 Exit 210 in Arlington.